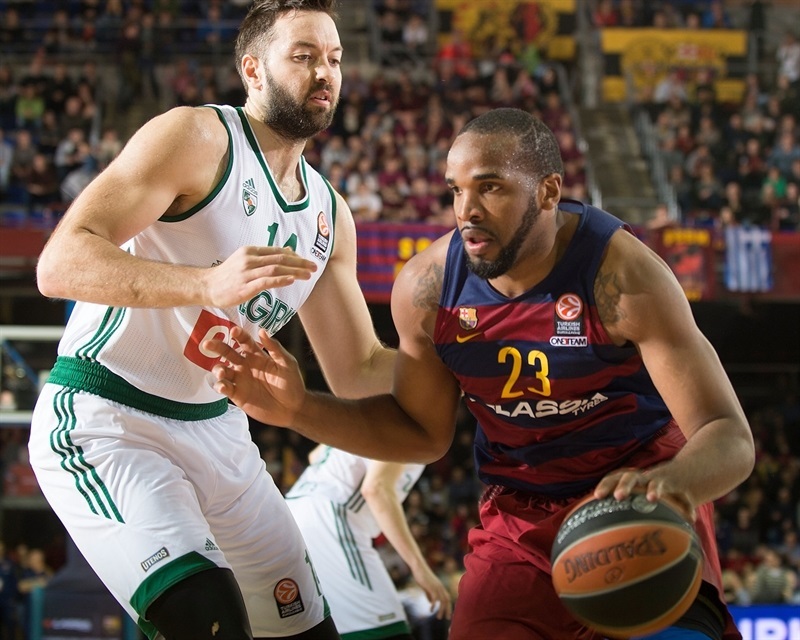 FC Barcelona Lassa improved to 3-4 in Group F by downing Zalgiris Kaunas 92-86 at home on Friday. 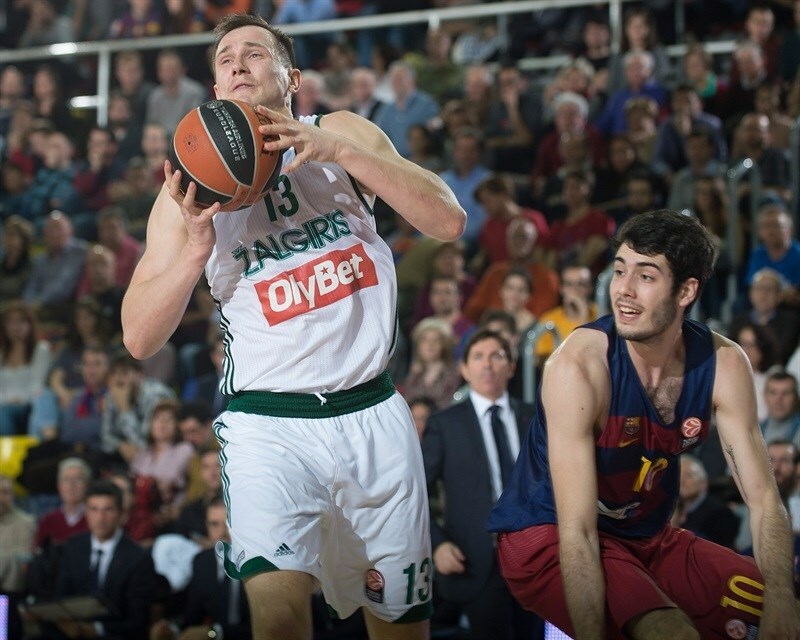 Barcelona snapped its two-game losing streak, while Zalgiris dropped to 1-6 at the halfway mark of the Top 16. Juan Carlos Navarro led the winners with 14 points, Pau Ribas added 13, Alex Abrines 12, Samardo Samuels 11 and Tomas Satoransky 10. Renaldas Seibuis led Zalgiris with 19 points, while Edgars Ulanovas starred with 17 points, 8 rebounds and 3 steals. Lukas Lekavicius added 16 points, Ian Vougioukas 14 and Paulius Jankunas posted 11 points and 7 rebounds in defeat. Vougioukas had 6 points in a 0-8 run that gave Zalgiris an early 4-12 lead. Navarro stepped up for Barcelona and a three-pointer by Justin Doellman brought the hosts within 16-19 after 10 minutes. 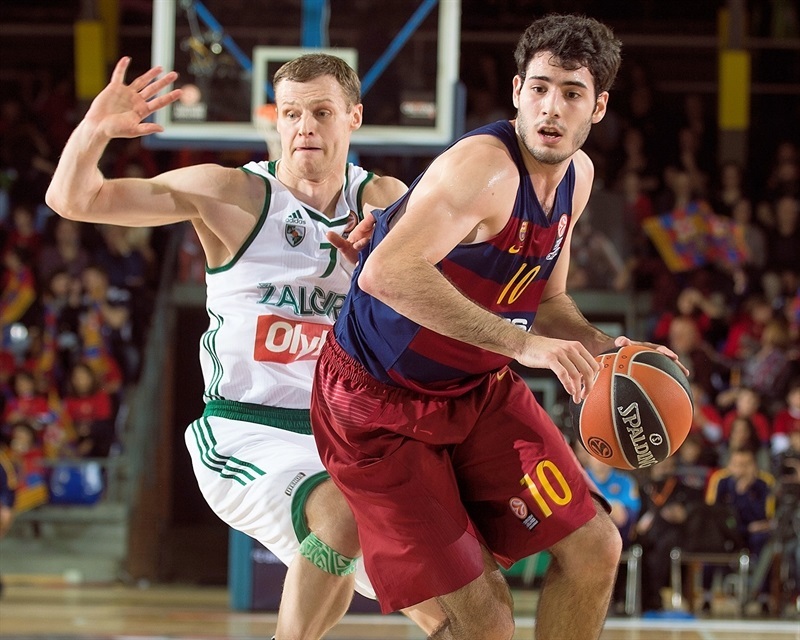 Sasha Vezenkov and Abrines fueled a 9-0 run that caused Zalgiris to call timeout at 29-23. A three-pointer by Satoransky made it a double-digit game, 36-26, but Martynas Sajus and Kaspars Vegvagars brought the guests within 38-31 at halftime. Abrines shined after the break and got plenty of help everywhere to give Barcelona a 65-55 margin after 30 minutes. 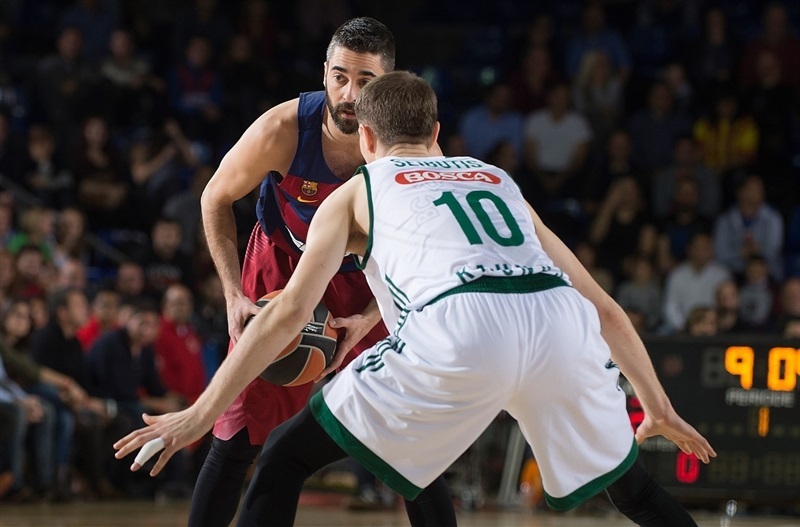 A dunk by Satoransky sealed the outcome, 73-57, with seven minutes to go, though Zalgiris never quit and pushed Barcelona until the final minutes. 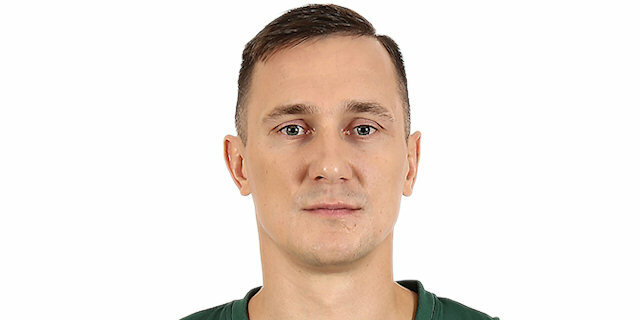 Samuels got Barcelona going with a layup, but free throws by Ulanovas and a five-meter jumper by Vougioukas gave Zalgiris its first lead, 2-4. Samuels shined with a backdoor layup, but Vougioukas hit a jump hook and Seibuis downed a jumper off the dribble. Vougioukas kept pushing Zalgiris with another jump hook and a driving layup that caused the hosts to call timeout at 4-12, after a 0-8 run. 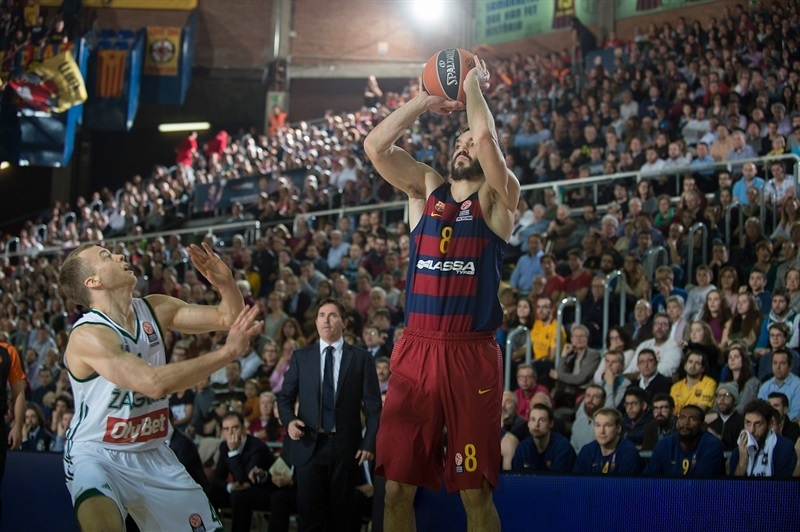 Navarro rescued Barcelona with a three-pointer and fed Ante Tomic for a close jumper that brought the hosts within 3. Lekavicius hit a one-handed jumper in the lane, which Navarro erased with his trademark bomba. Ulanovas nailed a big three-pointer over Tomic, who answered with a layup at the other end. Sajus scored around the basket, but Doellman did better with a three-pointer that fixed the score at 16-19 after 10 minutes. Tomic split free throws early in the quarter, but an unstoppable Vougioukas buried a baseline jumper for a 4-point Zalgiris lead. Brad Oleson buried a catch-and-shoot triple from the right corner and Martynas Pocius quickly answered with driving layup. Doellman split free throws and Pu Ribas hit two attempts to tie it at 23-23. Sasha Vezenkov came in after a timeout and immediately delivered with a layup off a steal. Shane Lawal split foul shots and Abrines struck from downtown to boost the hosts' lead to 29-23, after a 9-0 run. Zalgiris called timeout and Ulanovas nailed a three-pointer, but Oleson quickly answered with a six-meter jumper for a 31-26 Barcelona lead. Tomic and Navarro split free throws and a three-pointer by Tomas Satoransky made it a double-digit game, 36-26. Tomic picked up his third foul a minute before halftime. Sajus scored in the paint but Abrines matched that with free throws. A buzzer-beating triple by Kaspars Vegvagars brought Zalgiris within 36-29 at the break. Ulanovas made free throws immediately after the break and Jankunas added a put-back layup that made it a 3-point game. 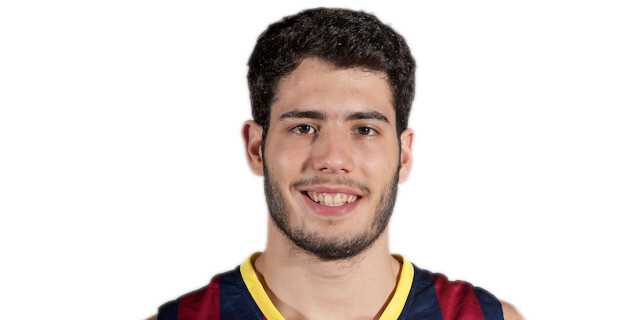 Abrines stepped up with a bomb from downtown and a six-meter jumper that restored a 43-35 Barcelona margin. 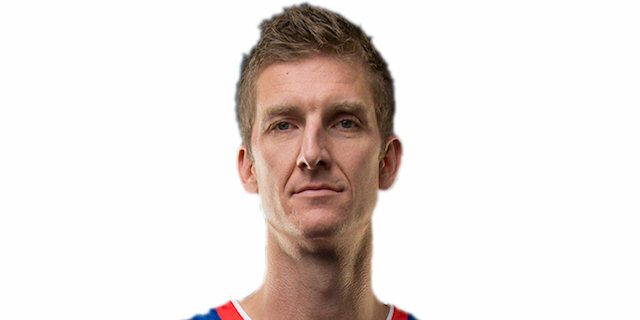 Doellman nailed a jumper from the elbow, which Seibutis matched with a six-meter shot. Ribas downed a three-pointer from the top of the key and added a floater to boost his team's lead to 50-37. Lekavicius hit a jumper and Jankunas bettered Lawal's put-back slam with a triple to make it 52-42. Navarro made free throws and a three-pointer by Seibutis got Zalgiris within single digits. Satoransky split foul shots and Navarro sank a triple, which prompted the guests stop the game at 58-45. 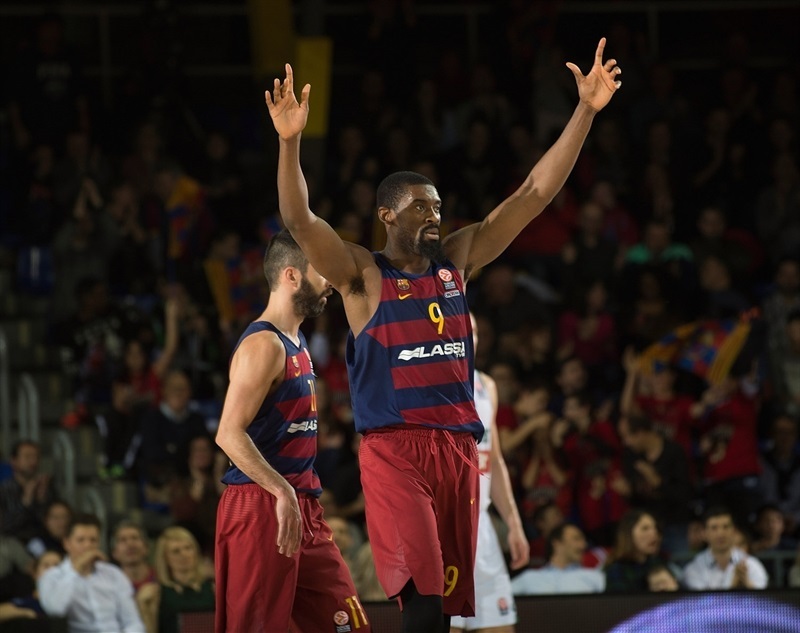 Lekavicius buried a corner triple and Seibutis split free throws, but Lawal kept Barcelona comfortably ahead, 60-49. After Vougioukas hit a jump hook, Stratos Perperoglou downed a triple and free throws by Satoransky made it a 14-point game. Lekavicius brought Zalgiris a bit closer, 65-55, after 30 minutes. Jankunas took over with an off-balance layup early in the quarter. Doellman split free throws and a driving layup by Perperoglou boosted the hosts' margin to 68-57. Navarro nailed a three-pointer off the dribble and a huge fast break dunk by Satoransky prompted Zalgiris to call timeout at 73-57. 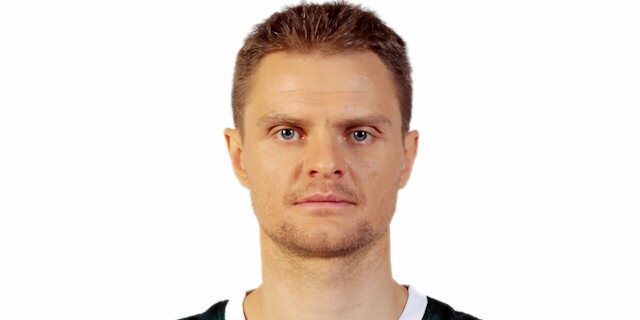 Lekavicius hit another corner triple and a backdoor layup by Seibutis gave Zalgiris hope at 73-62. 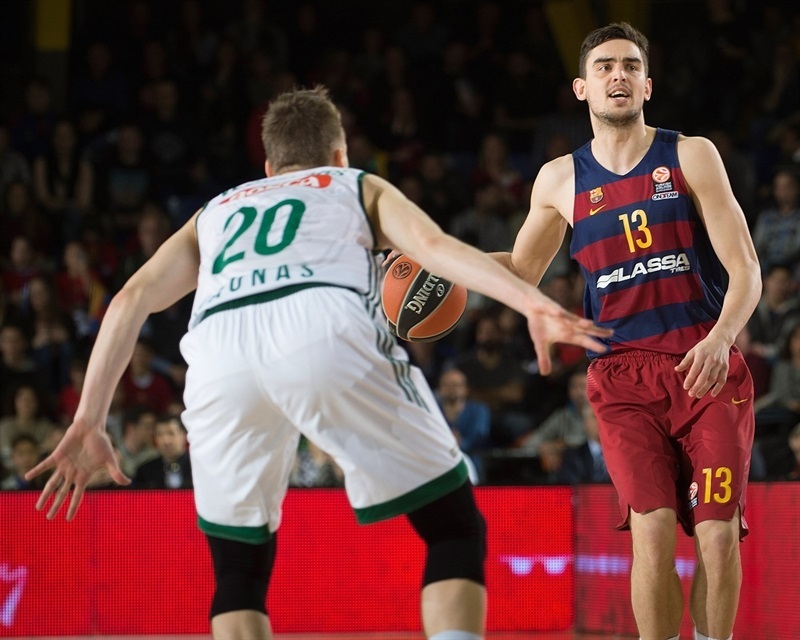 Perperoglou downed a turnaround jumper and a fast break layup by Satoransky kept Barcelona in control at 77-62. Seibutis and Vougioukas hit free throws and Lekavicius added an acrobatic layup, but Samuels kept the hosts comfortably ahead, 80-67. 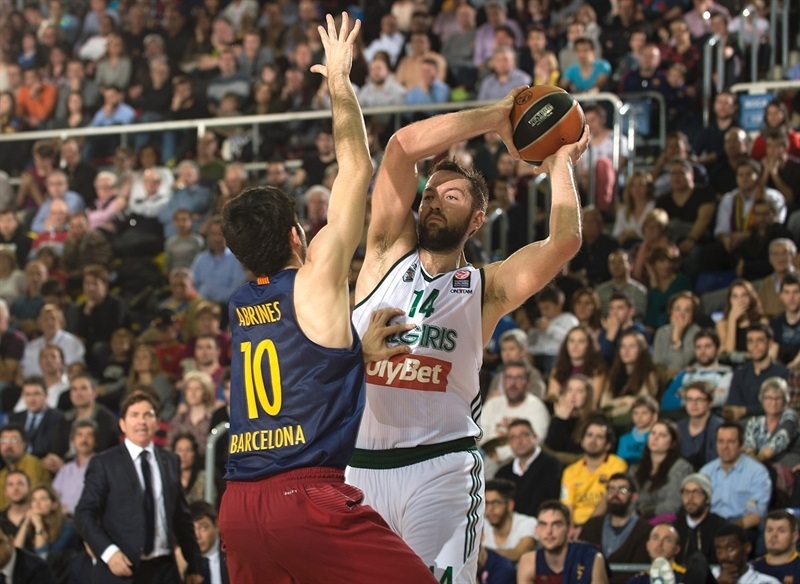 Seibutis returned to the foul line for two more and Vougioukas split attempts, but it was already too late for Zalgiris, as Barcelona kept full control of the situation until the final buzzer. "We are happy with this win. We played well on offense, other than in the opening five minutes. We missed a lot of free throw attempts but had good shooting percentages otherwise and played really well on offense for 35 minutes, too. 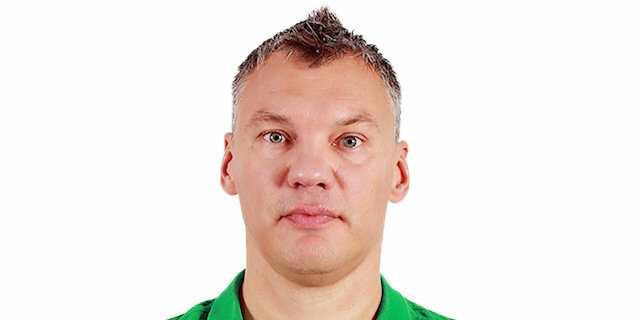 It was hard for us defensively: Zalgiris felt confident. But we managed to keep a seven-point lead for a big while. Winning is the most important thing and climbing a bit in this group's standings. The first leg of games is over and we stop for the Copa del Rey now, but our first game after that is at home against Olympiacos, which will have a lot of time to prepare this game. That will be a key game, very important for our future. It is very important to keep winning at home in the Top 16. All players have good and bad moments and I hope Ante Tomic will have a good game on Sunday. He is getting better every day and has to carry on. Like I said, all players have good and bad moments. Carlos Arroyo may see some playing time this weekend. The team has played well in the last couple of games, getting a index ranking of 100-plus in each of them. We are playing well on offense and have to improve on defense. We allowed a lot of points in the last two games. Our next game, against Olympiacos, is very, very important and we have to prepare it well no matter what we do in the Copa del Rey. We have to finish that competition and immerse ourselves in the Euroleague again. Olympiacos is a tough, competitive opponent and we have to know how to play big games. We know we have to play really well to beat teams like Olympiacos, CSKA and Madrid at home." 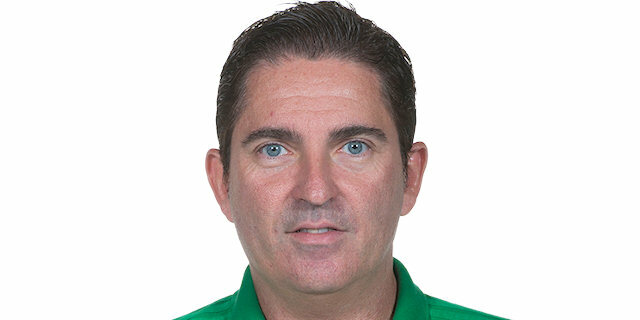 "First of all, congratulations to FC Barcelona and Xavi Pascual for this win. In general terms, I think we played quite well against a very good opponent. They got the lead in the second quarter due to small details and the lack of experience of some of our players. I am happy in general terms because we fought hard and gave a good image. Barcelona played much better than in our regular season game at Palau, in which they didn't take us seriously. They had the need to win, started the game at full speed and this is why I am happy with the way we played because truth to be told, Barcelona played quite well. They were a different team, more aggressive than in the regular season game. We have to keep giving our best in each game, in each practice and by the end of the game we will value the players that we have. There is nothing better for us than playing in this group, because it will give our young players very valuable experience. A lot of our young players will grow playing against the best players and the best teams in Europe." "We let them back in the game there at the end. We made stupid mistakes, but it's part of basketball and we got the win, which is the most important thing. We are a big team, everybody can play here, and that's the best part about it, as we have so many weapons. We've got to win more. If we lose we'll be out of the competition. So, we've go to win." "We didn't have a brilliant game, defensively, but I believe that the good work we did on offense was enough to win. We missed 11 free throw attempts and if we have made them, the game would have been very different. This was a very important game for us. A home loss tonight would have forced us to have a near-perfect second half of the Top 16, as you probably need eight wins to qualify. The fact that we won again is good for our confidence, especially now, right before the Copa del Rey." "It was too late probably to rally. Barcelona does not give you chances to come back easy when they are 15 points up. We tried to recover, had nothing to lose, and the margin at the end became smaller. Little details made the difference until the fourth quarter when we minimized the score. But we still lost, no matter by how many points." "We were prepared to play aggressive from the beginning, but in some moments we did not play like that. After the break we came with new orders and tried to play like coach said, with more aggressiveness. It helped, but we still have many things to do, and many things to improve. It's good to play better and better, but we have to start winning. It is good to play better, but playing better and losing is not what we want. We want to win."